We are a leading Manufacturer of feeder hopper pumps and feed hoppers screw pumps from Mumbai, India. We are the leading Manufacturer and Exporter of Feeder Hopper Pumps and our product is made of good quality in a wide range for its unique features. Feeder Hopper Pumps is having a strong metal body construction and a wheel on the right side which helps in running this pump. This pump is made of advanced quality materials. We are the leading Manufacturer and Exporter of Feeder Hopper Screw Pumps and our product is made of good quality in a wide range for its unique features. 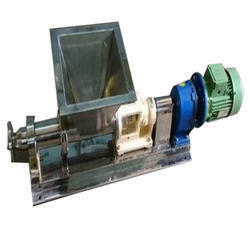 Feeder Hopper Screw Pumps is having a strong metal body construction and a wheel on the right side which helps in running this pump.